Happy Sunday! Folks, life is just hard, isn't it? There is pain and problems and forces coming against in all directions some days. There are mountains we are facing that seem insurmountable and those that are in the distant that we can barely see, but we know are there. And, many of us are choosing to live in defeat. We worry (oh, how I struggle with this) and we stress and we forget. 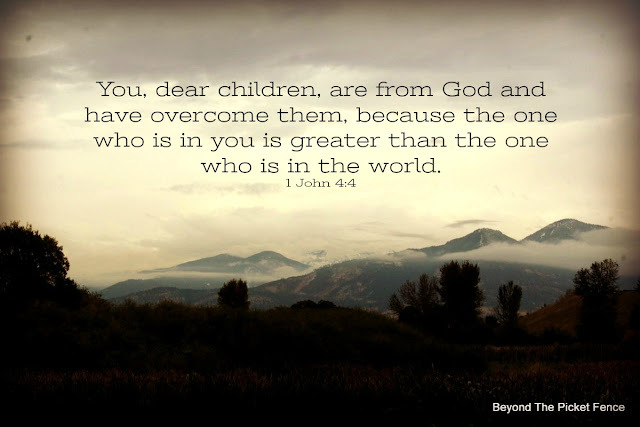 We forget that God has already won the victory, that HE is greater than anything we are facing, that HE has overcome the giants and the mountains we face. Let's claim and believe and live in the victory Christ won for us on the cross. Amen? HE is always there for us. Sometimes he may not make things happen exactly as we would like it to be, but he has a purpose.